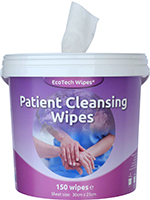 Especially designed for use in hospitals, nursing and residential homes, these wipes from EcoTech are ideal for use on patients to cleanse the skin. The mildly fragrances wet wipes are gentle and delicate on all types on skin and contain soothing and moisturising aloe Vera properties, leaving the skin feeling soft and fresh. The wipes are ideal for bed baths, baby care and infection control, both in and out of hospital.